At least once a year, Christians are reminded of Jesus’ prayer for his disciples that “they may be one so that the world may believe” (see John 17.21). Hearts are touched and Christians come together to pray for their unity. Congregations and parishes all over the world exchange preachers or arrange special ecumenical celebrations and prayer services. 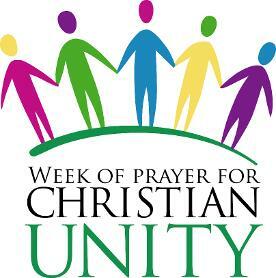 The event that touches off this special experience is the Week of Prayer for Christian Unity. Question - Is there such a thing as Christian unity? Sadly, not really. That's why we need to pray for unity and why, every so often, we meet with our fellow Christians and do things together, so that we understand each other better: and maybe find out that we're actually not that different from each other after all. The week from 18-25 January is Christian Unity week, but we're always a bit late here in the Midi, so we are holding the Saint-Pargoire event on Saturday 28 January, starting at 4:30 PM in our usual place, the Temple, shared between the three churches (Église Protestant, the Catholics and us). The 2017 theme for the Week of Prayer for Christian Unity is Reconciliation. This year marks the 500th anniversary of the beginnings of the Reformation. The theme: "Reconciliation – The Love of Christ Compels Us" (2 Corinthians 5:14-20) has been chosen. It has two accents: reflection upon the main concerns of the churches marked by Martin Luther's Reformation and secondly recognising the pain of the subsequent deep divisions which afflicted the unity of the Church. In selecting this theme, it is viewed as an opportunity to take steps toward reconciliation. Pope Francis has spoken about the need for Reconciliation between the Catholic Church and the Lutheran Church, thus ending 500 years of division (He is also working towards better relations with the Russian Orthodox Church — and other faiths, including Islam and Judaism). The Church of England is working towards reconciliation with other faiths, including other Protestant faiths, the Catholic church, Islam and others different faiths. The 500th anniversary of the Reformation has given many the opportunity to further understanding and reconciliation between the various faiths of our planet. Lutheranism is based on the teachings of Martin Luther, a German monk and professor who has been called the "Father of the Reformation." In 1517, he famously protested against the Roman Catholic Church and their sale of indulgences. In his sermons and writings, Luther stressed the doctrine of justification by faith alone and the authority of scripture alone. Lutheranism quickly spread throughout Germany and Scandinavia, and Protestantism in various forms could soon be found throughout Europe. In the 17th century, Lutherans from these countries began to migrate to the United States, bringing their language, culture, and Lutheran faith with them. to articles on the web. Anglican Journal. Week of Prayer for Christian Unity 2017 to focus on reconciliation. Church Times. That the 46,000 may be one. Church of England - Council for Christian Unity Web page. Ahead of the Week of Prayer for Christian Unity 2017, the Archbishops of Canterbury and York have issued a joint statement on the 500th anniversary of the Reformation. Read the statement by clicking on the button.